Port Moresby, Papua New Guinea: U.S. Embassy Port Moresby has selected Meriba Tulo from Papua New Guinea to participate in the United States Department of State’s International Visitor Leadership Program (IVLP) titled, The Role of Journalism in a Democratic Society. Mr. Tulo is a senior reporter and anchor at EM TV, one of four television networks in the country. 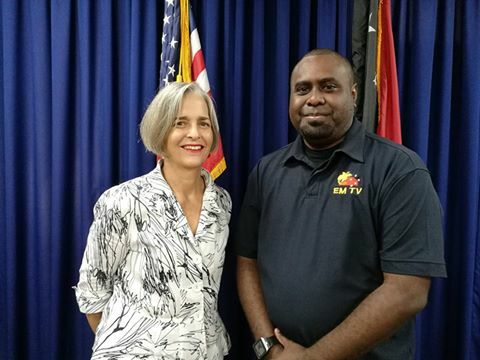 As a young journalist working at the country’s oldest television network, Mr. Tulo is aware of the changing media landscapes in Papua New Guinea with the advent of social media being accepted more and more as a source of news. “I am very excited about this program and looking forward to sharing and learning best practices from other participants from around the world, and bringing home some of these practices back to my workplace,” said Mr. Tulo. During Mr. Tulo’s program, September 25 to October 13, he will visit Washington D.C., New York, Iowa City, Seattle, Washington, and Portland, Oregon. The program will focus on the U.S. system of government, investigative journalism, and journalism education and training. It will also feature a panel discussion on new journalism models such as community engagement and new business models for reporting. Follow the Embassy Facebook page https://www.facebook.com/usembassyportmoresby/ for updates on Mr. Tulo’s trip. The IVLP is the U.S. Department of State’s premier professional exchange program that aims to provide firsthand knowledge about U.S. society, culture and politics, while cultivating lasting relationships. By connecting current and emerging foreign leaders with their American counterparts, IVLP fosters lasting relationships and helps strengthen U.S. engagement with countries around the world.